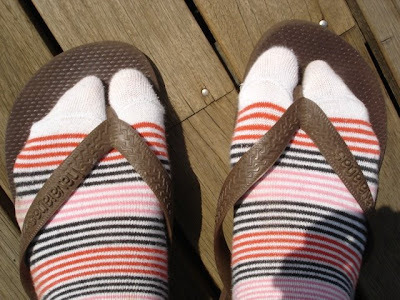 socks and thongs. it looks wrong, so wrong. but you know, it works. i'm always wearing socks around inside and inevitably i need to go outside a hundred times a day.. i need something from the studio.. have to bring the washing in (yes from the iconic hills hoist).. forgot to get the other something from the studio i went out to get the first time... need the gardening gloves from the shed.. water the tomatoes, etc etc and who has time to stop and put real shoes on? i think i might ask kingsley to sew a split in all my socks to allow for thongage... unless anyone knows where i can buy socks with a thong allowance?? who is this kingsley ... ? is he your butler? ha ha yes i am the butler!! sorry i didnt see this earlier, here is the answer to your problems! i bought some and they are fantastic!